There is more information available on this subject at Flashbang grenade on the English Wikipedia. A flashbang grenade, also known as a flash grenade or stun grenade, is a special type of grenade of human origin. Unlike frag grenades, these grenades are not intended for lethal use. Flashbangs use chemical reactions to produce an extremely bright flash of light and a very loud concussion blast when deployed, stunning targets, but doing very little physical damage to them. The primary purpose of a stun grenade is to temporarily blind and deafen the enemy. If the victim directly observes the flash, a still frame of what is observed by the victim will be seen for up to ten seconds, at which point their eyes will have returned to their unstimulated state. The flashbang grenade's use in combat scenarios has not been overlooked, serving to confuse, disorient, or momentarily distract a potential threat for five to ten seconds. Flashbangs saw widespread usage within 21st century armed forces, and they are also in use with the UNSC Armed Forces. They were used by the UNSC Marines Hellbringers squad in 2531, during the Harvest Campaign. Orbital Drop Shock Troopers are often equipped with flashbangs. Flashbangs were used during the Raid on Camp New Hope and during the training of the SPARTAN-III Gamma Company. Halo 3 possesses a piece of Covenant equipment serving a similar function as a flashbang, the Flare, which is used to blind all nearby players (even if they can't see it), though it lacks the deafening effect of a flashbang. It does, however, have a noise that can drown out certain other sounds. Starting with Halo 3: ODST and carrying over to Halo: Reach, ODSTs can be seen carrying flashbangs on their belts along with a similar container colored blue with an unknown purpose. 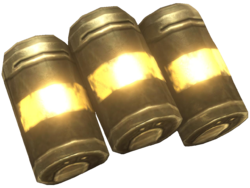 Flashbang Grenades on an ODST's combat utility belt.